We will learn how to make a web server that controls two LEDs. The ESP8266 WiFi Module is a self contained SOC (System On a Chip) with integrated TCP/IP protocol stack that can give any microcontroller access to your WiFi network. The ESP8266 WiFi Module is capable of either hosting an application or offloading all Wi-Fi networking functions from another application processor. Each ESP8266 WiFi Module comes pre-programmed with an AT command set firmware, meaning, you can simply hook this up to your Arduino board and get about as much WiFi-ability as a WiFi Shield offers. 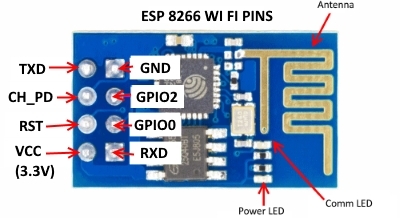 The ESP8266 WiFi Module is an extremely cost effective board. This module has a powerful enough on-board processing and storage capability that allows it to be integrated with the sensors and other application specific devices through its GPIOs (General Purpose Input Output) with minimal development up-front and minimal loading during runtime. Its high degree of on-chip integration allows for minimal external circuitry, including the front-end module, is designed to occupy minimal PCB area. The ESP8266 supports APSD for VoIP applications and Bluetooth co-existance interfaces, it contains a self-calibrated RF allowing it to work under all operating conditions, and requires no external RF parts. In short, the ESP8266 module is a TTL "Serial to Wireless Internet" device, a small microprocessor with built in wi-fi. It is faster than most Arduino boards and has more memory than most Arduino boards and has less pins than an Arduino board. 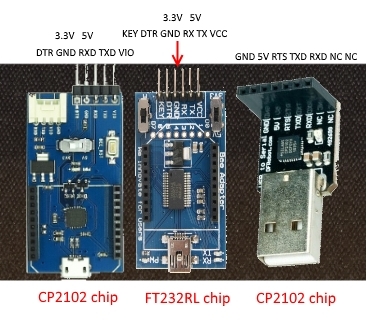 The ESP8266 comes in a wide variety of versions (as shown in the figure below). See the module list here. The ESP8266 WI FI module can be controlled from your local wifi network or from the internet (after port forwarding set on your router). 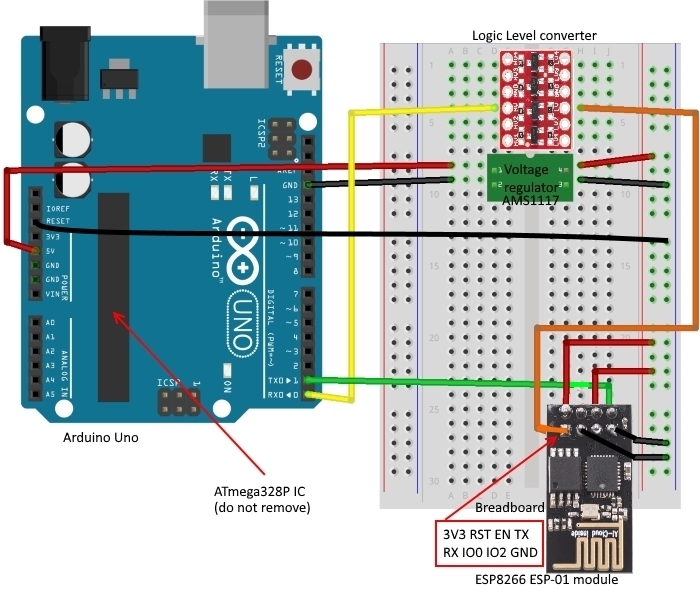 The ESP8266 communicates with the Arduino through a serial interface. It uses the Arduino’s Rx and Tx pins (digital pins 0 and 1) connected to the ESP8266 ESP-01 module for receiving commands and communicates back. The module features a full TCP/UDP stack support and can be configured as a web server. ESP-01 module powers the onboard ESP8266 through 3.3V. You will have to use a voltage regulator AMS1117 3.3 V or like the 78R33 to step down the 5V from the Arduino to 3.3V or voltage divider (You can find some info here with online calculation sheet) in order to power up the ESP8266. The ESP8266 does not come with an USB connector on it. 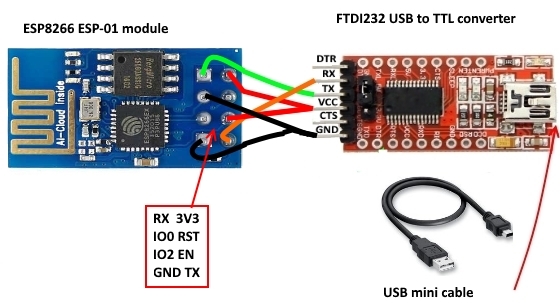 You need an additional component for ESP8266 to communicate with the PC or laptop via USB port. 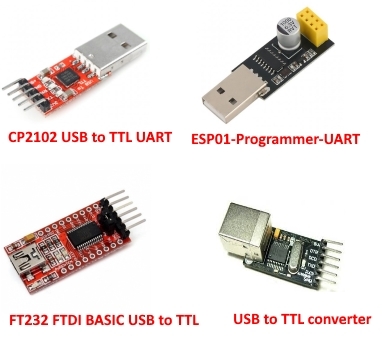 It's called USB to TTL serial adapter (for example, USB adapter for ESP8266 ESP-01, FT232RL FTDI USB to TTL Serial Adapter, CP2102 USB to TTL UART converter). So we can either use a USB to TTL serial adapter (converter) or use an Arduino to communicate and upload the code to the ESP8266. We will use ESP8266 ESP-01 module in this project. It has 2 GPIO pins that can be programmed to turn an LED or a relay ON/OFF through the internet. The ESP-01 module contains the ESP8266 MCU and a flash memory chip. 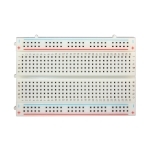 There are two LED's: a red one which indicates power is connected to the module, and a blue one which indicates data flow, and can also be controlled by user programming. The Wi-Fi antenna is the PCB trace that covers the top of the module; it's called a Meandered Inverted-F Antenna (MIFA,) is surprisingly efficient, and only mildly directional. There are eight connection pads near the bottom of the module. Usually, two 4-pin male headers are inserted in the rear of the module and soldered on the front. This makes the I/Os accessible, but is not breadboard friendly, and requires flywires from the ESP-01 to a solderless breadboard. This technique works, but it is messy. 1. Access Point (AP) — In AP, the Wi-Fi module acts as a Wi-Fi network, or access point (hence the name). It allows other devices to connect to it. And establishes a two-way communication between the ESP8266 and the device that is connected to it via Wi-Fi. 2. Station (STA) — In STA mode, the ESP-01 can connect to an AP (access point) such as the Wi-Fi network from your house. This allows any device connected to that network to communicate with the module. 3. Both — In this mode ESP-01 act as both an AP as well as in STA mode. Refer to the following site for more ESP8266 AT commands. 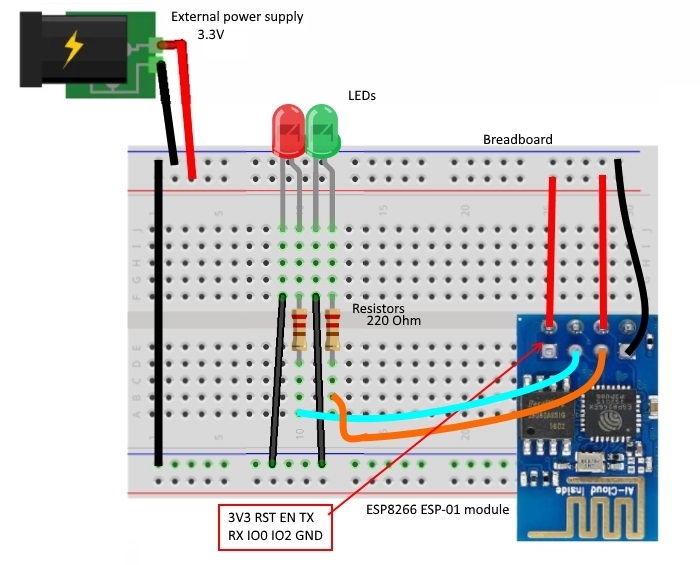 ESP8266 ESP-01 module can be set in Flash mode or UART download mode (for uploading new firmware or program) and Boot mode or Flash Boot Mode (normal startup and execution of existing firmware or program). ESPlorer — Integrated Development Environment (IDE) for ESP8266 developers. The essential multiplatforms tools for any ESP8266 developer from luatool author’s, including a LUA for NodeMCU and MicroPython. Also, AT commands are supported. Required JAVA (SE version 7 and above) installed. Smart send data to ESP8266 (without dumb send with fixed line delay), check correct answer from ESP8266 after every lines. 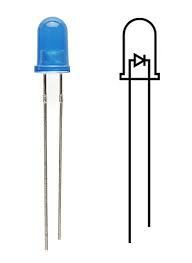 The operating voltage of the LED is 1.8V and the operating current is 10mA-20mA. The Arduino Uno board can supply 5V or 3.3V power. We will use 5V for this project, so the minimum resistance of the current limiting resistor should be (5 V to 1.8 V)/20 = 160 Om. 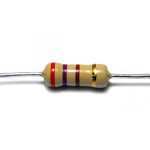 The 220 Om offered in the kit is suitable and you can also choose other resistors that meet the condition. The larger the resistance is, the dimmer the LED will get. TXD (TX, TXO or UTXD) - transmit pin. Connected to Arduino Uno pin 1. RXD (RX, RXI or URXD) - receive pin. Connected to Arduino Uno pin 0. 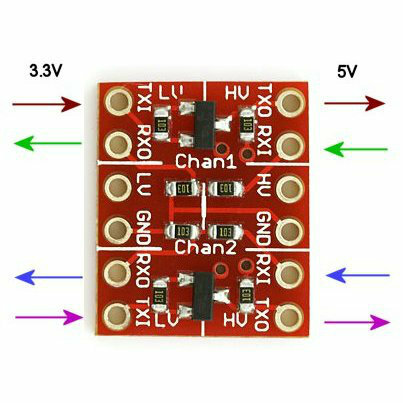 VCC (3V3 or 3.3V) - power supply pin (3-3.6V). Connected to 3.3V DC 1A and more external power supply. The current required for the ESP-01 during Wi-Fi operation vary from 250mA to 750mA. RST (RESET) - reset pin. Keep it on high (3.3V) for normal operation. Put it on 0V to reset the chip. CH_PD (CHIP_EN or EN) - Chip enable. Keep it on high (3.3V) for normal operation. GPIO0, GPIO2 (IO0, IO2) - General Purpose Input Output pins. GPIO0 also controls the module mode (programming or normal operation). In our case (normal operation), it shall be connected to 3.3V (high). GPIO2 is not used in this example. It is very easy. Simply insert ESP8266 ESP-01 module to ESP01 programmer UART. However to go to flash mode you need to have GPIO0 pin grounded (attached to GND pin). A small modification on the back of ESP01 programmer UART posible to make the life more easy. You can just shift jumper from GND-GND to GND-GPIO0 position. The ESP8266 powered up using a separate 3.3 V power source or a voltage regulator AMS1117 3.3 V or 78R33 or a voltage divider. Note: Do not plug in ESP8266 ESP-01 module directly to 3.3V Arduino Uno board pin as the ESP8266 ESP-01 module may draw more current than the 3.3V regulator on your Arduino can supply so you can damage your Arduino board. ESP-01 module. It is required to have Arduino version 1.6.4 or higher in order to install the ESP8266’s platform packages. The Arduino environment has to be set up to make it compatible with the ESP8266 ESP-01 module. 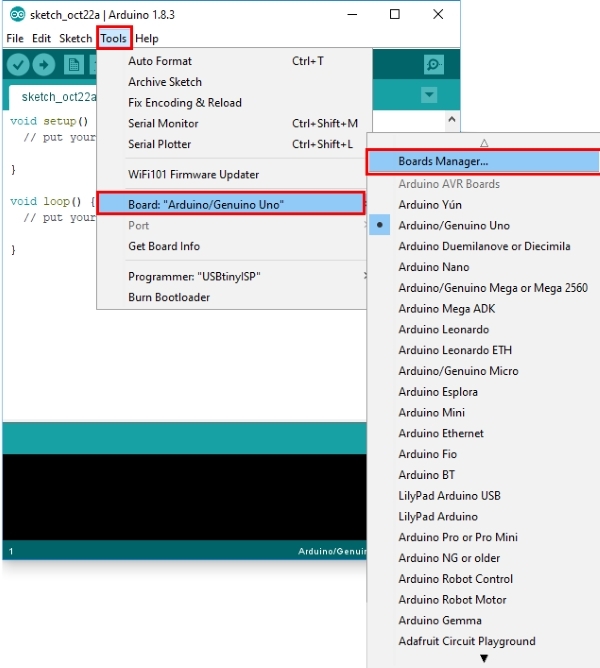 It is required to have Arduino IDE version 1.6.4 or higher in order to install the ESP8266’s platform packages. 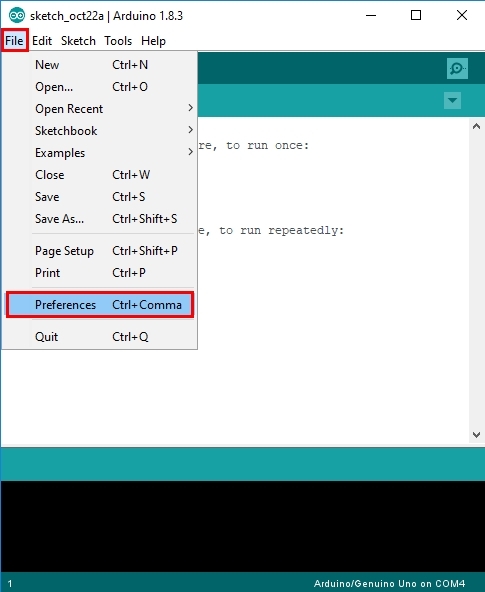 Open the Preferences window from the Arduino IDE. Go to File -> Preferences. There should be a couple new entries in addition to the standard Arduino boards. Look for esp8266. or scroll down to the ESP8266 entry (usually at the bottom). 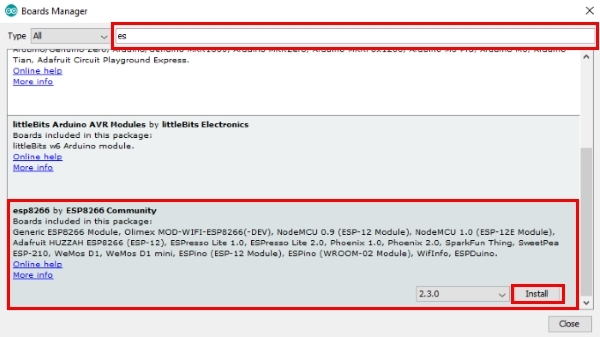 Select the ESP8266 entry. When you click it an install option will appear. Select the latest version and click install. The board definitions and tools for the ESP8266 include a whole new set of gcc, g++, and other reasonably large, compiled binaries, so it may take a few minutes to download and install (the archived file is ~110MB). Once the installation has completed, an Arduino-blue “INSTALLED” will appear next to the entry. You will see Generic ESP8266 Module on the bottom of the Serial Monitor window. Plug your USB to TTL converter with DTR Pin or without DTR Pin or ESP01 programmer UAR into your PC USB port. Select the correct com port. 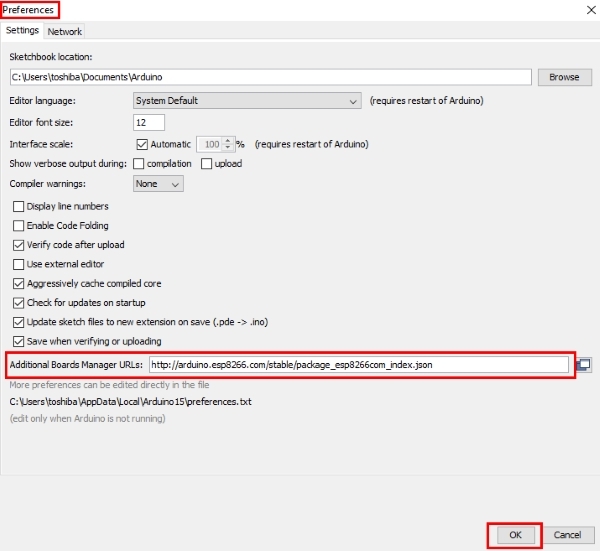 Replace the SSID and password in the webserversketch with your own data. Verify and upload the webserversketch to your ESP8266 ESP-01 module. AT commands will not work after that. You need to Flash the firmware to enable them again. Open Serial monitor at baud rate of 115200 bps. You will see the IP address of your ESP8266 ESP-01 module. 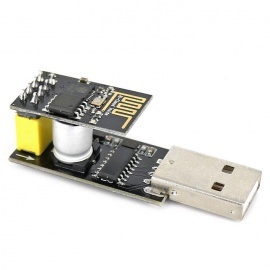 Plug your Adruino Uno board into your PC USB port. Open any browser from a device (PC, cell phone, tablet) that is connected to the same router that your ESP8266 ESP-01 module is. Type the IP address (for example we had 192.168.0.115) which you have seen in Arduino IDE serial monitor and press Enter button. You can control LEDs now. Let’s create a web server that controls two outputs (GPIO0 and GPIO2). Replace the SSID and password with your own data. NOTE: Make sure that GPIO0 is grounded while uploading the code. We have learnt how to make a web server that controls two LEDs. ESP8266WiFi library included in Arduino IDE. 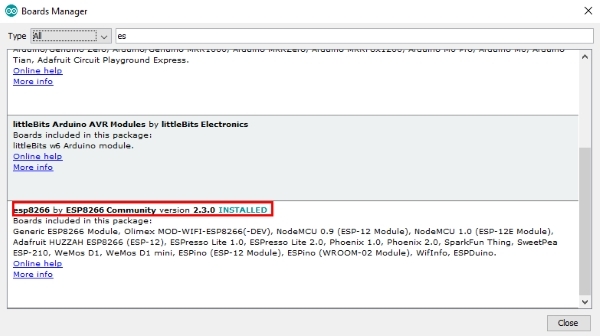 ESP8266WebServer library included in Arduino IDE. ESP8266mDNS library included in Arduino IDE.